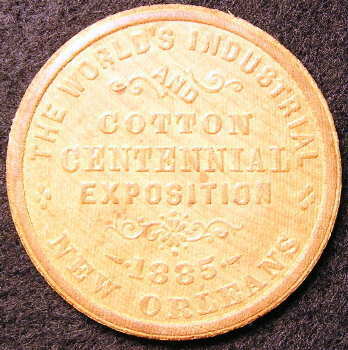 The 1884 World's Industrial and Cotton Centennial Exposition was held in New Orleans at least in part to advertise the city's commercial revitalization following the end of the Reconstruction era. Also to commemorate the centennial of the first shipment of cotton from the United States to England and to advertise the cotton industry. 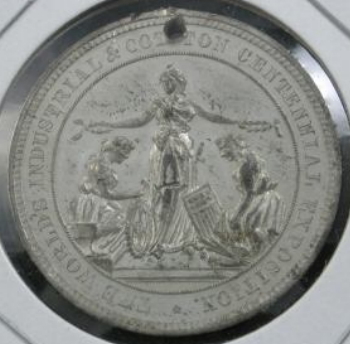 The obverse is a fine example of detailed engravers work. 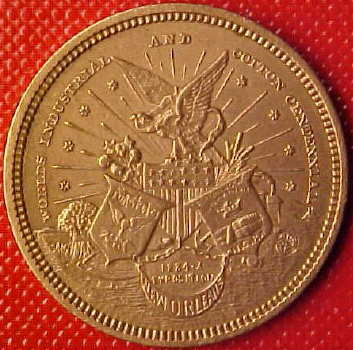 On a bronze colored coin, slightly larger than a quarter, the words, "World's Industrial and Cotton Centennial" are inscribed around an elaborate design of an Eagle with a banner in its beak, perched on a U.S. shield with a chained connection to two other shields. One shield is inscribed "Justice" with scales, and the other shield is that of the National Cotton Producers Association inscribed "N.C.P.A." with a bale of cotton. Below these two shields is "1884-5" over the word "Exposition", cradled by a banner joining the Justice and N.C.P.A. 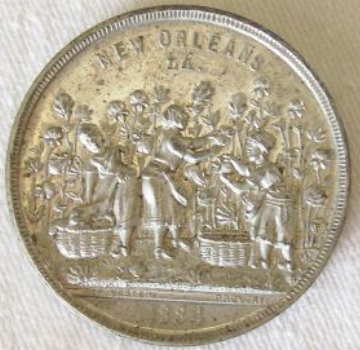 shields together and inscribed with the words "New Orleans". 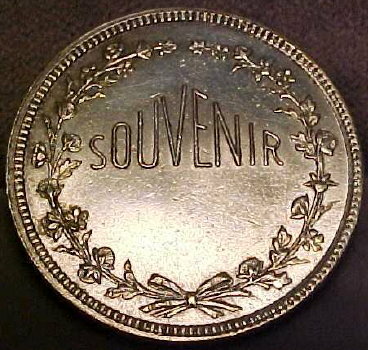 The reverse displays the word "Souvenir" in a wreath of cotton. Above. 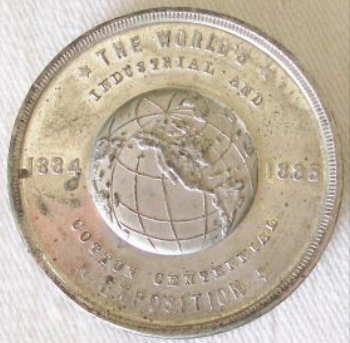 1885 WORLD'S INDUSTRIAL & COTTON CENTENNIAL EXPO This medal/token is listed in "UNITED STATES TRADE TOKENS 1866-1889," by Russell Rulau: Rulau # La-NO 52 1885 Brass 26mm and Plain Edge. 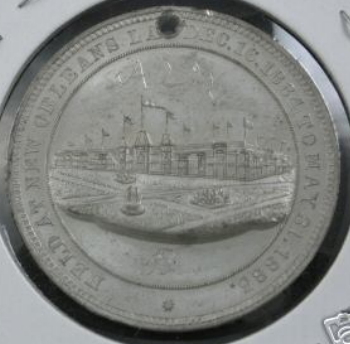 This is an Early RARE SILVER Medal from New Orleans Louisiana issued during the World's Fair Industrial and Cotton Centennial Exposition held there between 1884 - 1885. 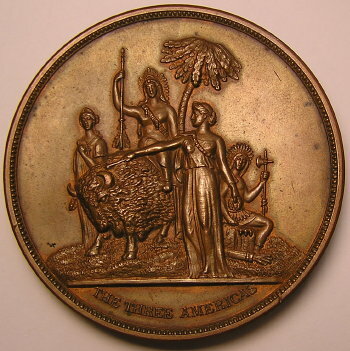 This Medal was struck in Silver and features an Eagle with American Flag and Banners on the obverse. This Medal measures 25 mm in diameter and grades in UNCIRCULATED Condition. 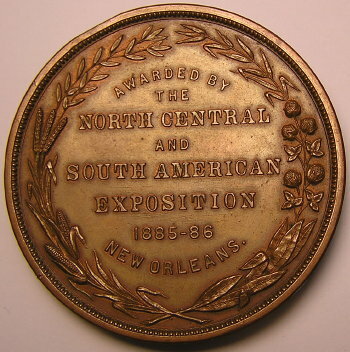 a medal from the 1886 North, Central And South American Exposition that was held in New Orleans, Louisiana. 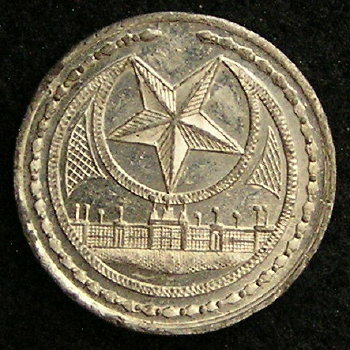 The medal is listed in the 4th edition of the Standard Catalog of United States Tokens 1700-1900 on page 652 with catalog number Rulau La-NO 29. 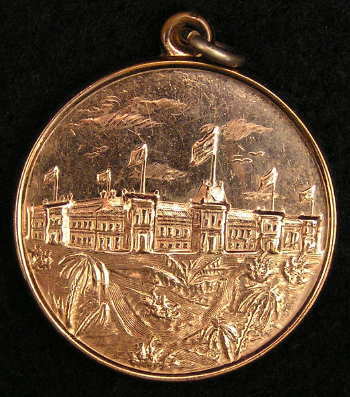 This medal is 1 1/4 inch in diameter, made of silvered white metal and in un circulated condition. 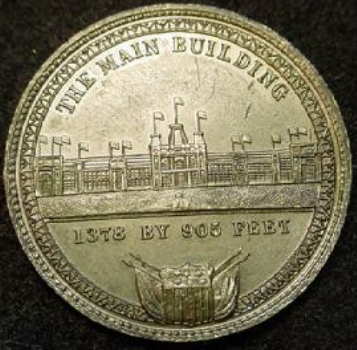 (see photos) The obverse shows the Expo building in the center and above it reads THE MAIN BUILDING and below 1378 BY 905 FEET. At the bottom there is a shield flanked by four flags. 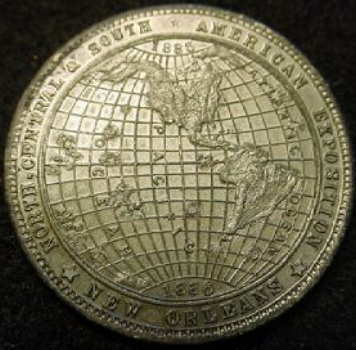 On the reverse there is a globe showing the Western Hemisphere. 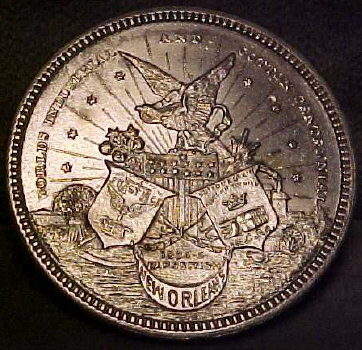 1885 a the North Pole and 1886 at the South Pole and around the outside it reads NORTH, CENTRAL & SOUTH AMERICAN EXPOSITION, NEW ORLEANS. This is a very nice medal in outstanding condition. High grade unc, proof like with frosted dives, striking cameo medal, white metal, super detailed obv artwork. Proclaim Liberty Throughout The Land To All The Inhabitants Thereof . Philada By Order Of The Pass And Stow Philada MDCCLIII on bell . Lev XXV VX below bell & Liberty Bell above. 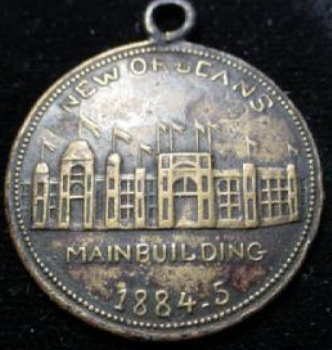 reverse By Joint Resolution Of The Councils Of The City Of Philadelphia The Liberty Bell Loaned To The Worlds Industrial And Cotton Centennial Exposition Of New Orleans LA 1885. Back - New Orleans, LA Heavily Detailed Cotton Fields and Workers, 1884. 1884-5 with picture of main building. One sided. 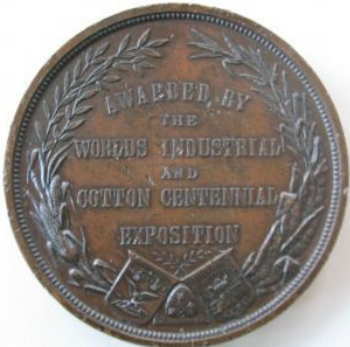 LA Cotton Exposition Centennial Medals, 1884. Two New Orleans medals. "World's Industrial and Cotton Centennial" around elaborate design of eagle with banner in beak, resting on three shields: US shield, shield inscribed "Justice" with scales, and shield of the National Cotton Producers Association inscribed "N.C.P.A." with a bale of cotton, below is 1884-5 Exposition, New Orleans." 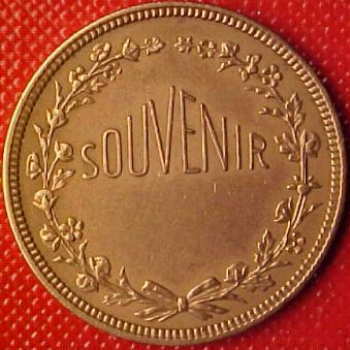 Reverse "Souvenir" in a wreath of cotton. The obverse was so detailed that it was difficult to strike, which explains why Rulau La-52 does not have a photo. Two pieces, 25 mm, both brass, about VF-XF. 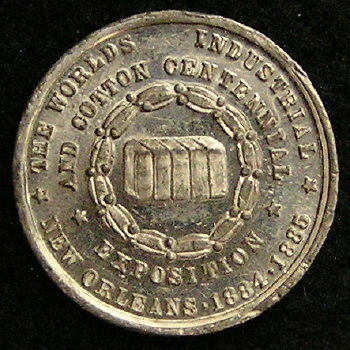 1885 WOOD SOUVENIR COIN MARKED "THE WORLD'S INDUSTRIAL COTTON CENTENNIAL EXPOSITION IN NEW ORLEANS 1885". 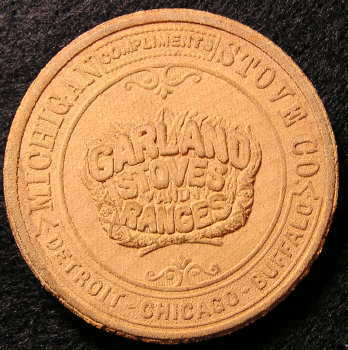 PASSED OUT BY & MARKED "COMPLIMENTS MICHIGAN STOVE CO. DETROIT, CHICAGO, BUFFALO" "GARLAND STOVES AND RANGES". CHECK OUT PICTURES THIS IS A EXCEPTIONAL ITEM FROM 1885, AND VERY DETAILED AT 1 5/8" ROUND & QUITE THICK MADE OF ALL WOOD. 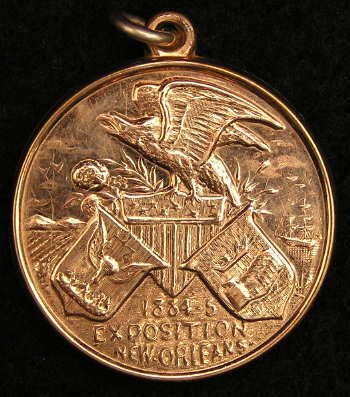 Medal from the 1885-1886 North, Central, and South American Exposition held in New Orleans, Louisiana. 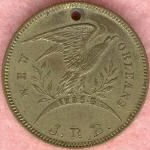 The obverse pictures a proud eagle standing on a crescent, which has the dates 1885-6 on it, "New Orleans" to the right and left, with the initials "J.R.B." neatly stamped below. 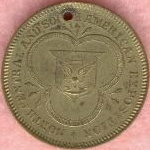 The reverse of the medal pictures a shield within a trefoil, surrounded by the exposition name. It is struck in Gilt Brass, 25 mm in diameter, and in AU condition, although holed as made. 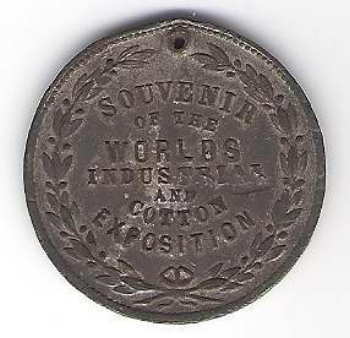 This is a bronze 3" award medal from the World Industrial and Cotton Centennial Exposition held in New Orleans in 1884-5. Minimal wear with a few light scratches and tiny dents on body and along edges. Minted by P.L. Krider in Philadelphia. 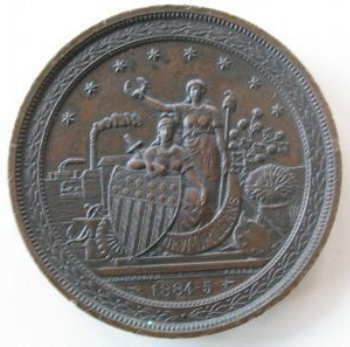 1886.Bronze 260 grams, 73.3mm. Obv. THE THREE AMERICAS, Buffalo with Religion, Columbia and two Indians in feather headdress. Rev. Wreath of cotton, tobacco, corn and wheat encloses 8-line inscription of this little-known New Orleans exposition. Charming style, much mint red luster. About Uncirculated. UNLISTED Cotton Centennial Liberty Bell Dollar, 1885. 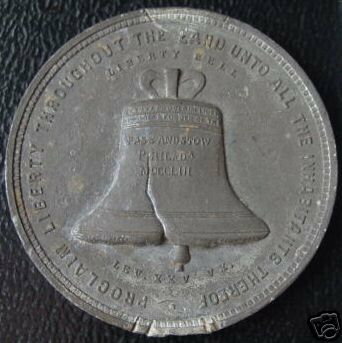 Very similar Liberty Bell obv to 1876 HK-23 w/o dates; 11-line insrc on Liberty Bell from Philadelphia to N.O. Cotton Expo. WM, 37mm. BRIGHT proof-like AU+, Nice! One side as the reverse of HK143; the other side unlisted. "The. Worlds Exposition 1884 1885" Rv: "Industrial And Cotton Centennial Exposition New Orleans", "Union Confidence And Justice". Very rare. White metal. Exactly 33mm. 32.9mm White metal, One side as the reverse of HK143; the other side unlisted. Probably very rare to extremely rare. "The. Worlds Exposition 1884 1885" Rv: "Reunion Of Mexican War Veteran At.N.O. 1846-7"
37.6mm, White metal. 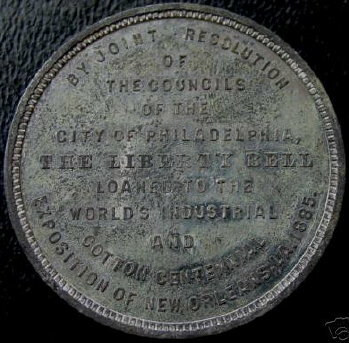 The reverse reads: "By Joint Resolution Of The Councils Of The City Of Philadelphia, The Liberty Bell Loaned To The World's Industrial And Cotton Centennial Exposition Of New Orleans, La. 1885." HK 144 B 1884-1885. 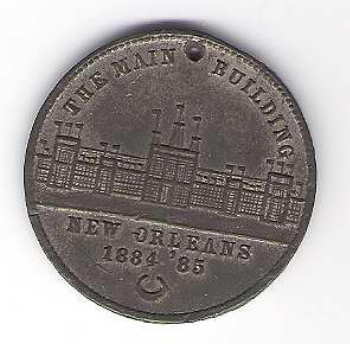 LIBERTY BELL DOLLAR New Orleans Industrial and Cotton Exposition. White Metal.